It’s that time of year again… I love scaring myself with a creepy book, or immersing myself in a gothic world. If you’re looking for something to read this Halloween, here are some of the best spooky books I’ve read in the last year. Let me know in the comments if you have any recommendations for me! 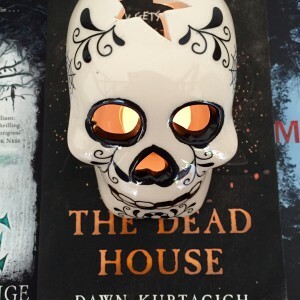 Released in August, Dawn Kurtagich’s debut novel is a proper horror story — no wishy-washy ‘don’t scare the children’ writing here. Told through a variety of media, it’s uniquely written, and is unsettling in the most satisfying of ways. A Halloween read to truly scare! A castle. A curse. A dangerous summer. Leo has invited Kate and a few friends to spend the summer at his inheritance, Darkmere Castle: as wild and remote as it is beautiful. Kate thinks it will be the perfect place for her and Leo to get together – but instead, she’s drawn into the dark story of a young nineteenth-century bride who haunts the tunnels and towers of the house. And whose curse now hangs over them all. 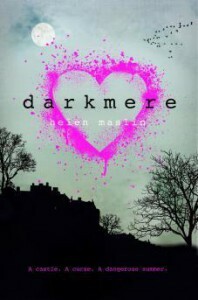 Another August debut, Helen Maslin’s Darkmere is a wonderful ghost story that’s part contemporary and part historical. 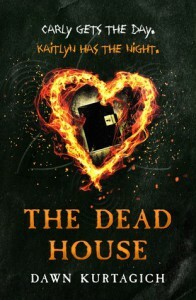 It’s not terrifying or gory like The Dead House, but chilling in a romantic, old-fashioned gothic way (which is my favourite kind of scary book). Haunted castles, secret passageways, and illicit nighttime activities — yes please! Seventeen-year-old Elliott hasn’t slept properly for months. Not since the accident that nearly killed him. Sometimes he half-wakes, paralysed, while shadowy figures move around him. Other times he is the one moving around, while his body lies asleep on the bed. His doctors say sleep paralysis and out of body experiences are harmless – but to Elliott they’re terrifying. 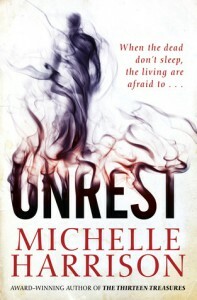 I read Unrest at the beginning of the year without any expectations, and became completely absorbed. It’s full of twists and turns, and is incredibly clever, whilst also being very creepy. 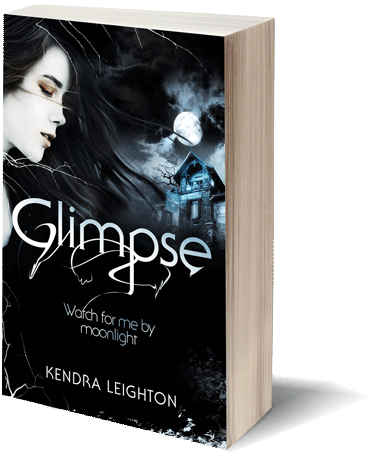 If you like your ghost stories to have smart twists and layers, this is the book for you. No Halloween list would be complete without a James Dawson book. 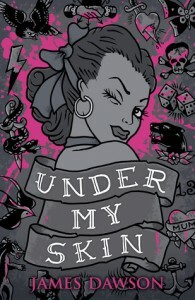 Under My Skin takes a really unique concept (who wouldn’t want to read about a possessed tattoo?) and is as entertaining as you’d expect. It probably won’t give you nightmares like Say Her Name, but it’s a lot of fun. One to read with a bowl of Halloween sweets by your side. Uncle Montague’s Tales of Terror is a collection of scary short stories which cleverly link together at the end of the book. The stories feature terrible things happening to naughty children, and read like a cross between M.R. James and Tim Burton. 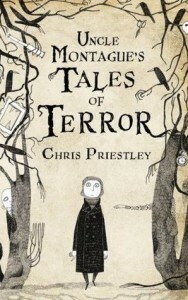 Chris Priestley has written many a scary book, and is the perfect author to read at Halloween. 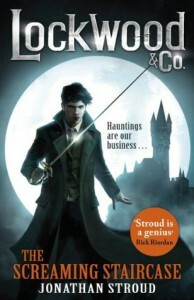 Jonathan Stroud’s Lockwood & Co. series is one of my favourites. About a team of young ghost hunters, it’s funny, smart and scary all at the same time. I loved the first two books and am looking forward to getting my hands on the third. At sixteen Nash thought that the fight to become Head Girl of prestigious boarding school Bathory would be the biggest battle she’d face. Until her brother’s disappearance leads to Nash being trapped at the school over Christmas with Bathory’s assorted misfits. As a blizzard rages outside, strange things are afoot in the school’s hallways, and legends of the mysterious Beast of Bathory – a big cat rumoured to roam the moors outside the school – run wild. Yet when the girls’ Matron goes missing it’s clear that something altogether darker is to blame – and that they’ll have to stick together if they hope to survive. 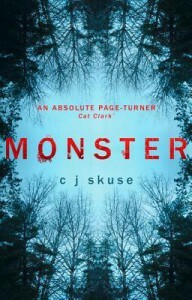 Monster came out last month, making it perfectly timed for long winter nights. It’s got murder, mystery, and cold weather in snow-shovel loads. The mystery builds slowly — is the Beast of Bathory real? Who can be trusted? — and leads to a satisfyingly dramatic denouement. I forgot all about Uncle Montague’s Tales of Terror! I only read it a month or two ago. That would have been perfect for my list of Halloween books.